Warren Kremer and Sid Couchey - Richie Rich the Poor Little Rich Boy #1 Cover and Complete Stories Original Art (Harvey, 1960). How often do you get a chance to bid on and win the very first cover for one of the most popular Silver Age comic book icons ever created? Back the cover art up with stories that appeared in the same first issue, and how could any collector resist such an offering? Richie Rich proved so popular he headlined no less than 46 titles! Included in this lot are the historic Richie Rich #1 cover (Warren Kremer art), a 1-page Richie Rich story (Sid Couchey art), "Early to Bed" (a 5-page Richie Rich story, Sid Couchey art), a 1-page Pee Wee story (Kremer art), a 1-page Little Dot story (Couchey art), "For the Birds" (a 5-page Richie Rich story, Couchey art), "Uncle Tape's Speedy Fixer" (a 5-page Little Dot story, Couchey art), and "Singing Sensation" (a 5-page Little Lotta story, Couchey art), The cover has an image area of 7" x 10.5", and its logo stat is a replacement. There are a few touches of white-out; otherwise the cover is in Excellent condition. 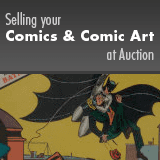 The image area of each story page measures 12" x 18", and the pages average Excellent condition. Also included are the two original Harvey production envelopes in which the pages were stored.